The Butterfly Effect - Right There. We Made It, We Did. Working on exhibition - adding character. Work begins on Made in Hull exhibition. Face your partners for a visit by Hull Folk Dance Club at Derringham. On the first sunny day in May, what better way to spend it than learning how to do folk dancing. Inviting the Wednesday Butterflies Derringham group to ‘take your partner by the hand’ were the Hull Folk Dance Club, who hold regular meetings at the Darby & Joan Hall in Cottingham. I have never been to a folk or a barn dance and when we were all told line up to face our partners, the traditional ball scenes in Jane Austen came to mind. All that bowing and fancy footwork… thankfully the folk dance group cater for everyone, giving you time to get to to grips with each step. Our first dance, the Circassian Circle, sees the women then the men entering the centre of the circle consecutively and clapping on the fourth step. I struggled with the promenade that follows, you have to cross your hands and allow your partner to lead you round, I kept getting my hands in knots. The steps are called out in time to the music by The Caller, so after a while after hearing the same instructions repeated so many times, it eventually begins to sink in; for that dance anyway. Our two callers today were both called Sue and also present were Ray and Keith, Club Secretary and Chairman of Hull Folk Dance Club respectively. As a gentle introduction the Butterflies enjoyed ‘Bridge of Athlome’ - that’s the one where each partner goes down the tunnel made by the rest of the couples forming a row of arches. Then there was the one with all the hand clapping called ‘Pat a Cake Polka’ 123 left hand 123 right hand 123 both hands, 123 on your knees… It was also the one where everyone changed partner with every sequence, that mean’t everybody got to dance with everybody else, at least once. Providing moments of respite from all the dancing were duets by Sue on flute and Ken on clarinet playing ‘Rothbury Hills’ and ‘Coquetdale Waltz’. ‘White Coppice Jig’ was my favourite and I partnered Sue from the club for this dance, she was a very gracious and patient guide. The one that seemed to cause the most confusion was the ‘Leaving of Liverpool’. That’s the one with the gates and those confusing crossovers. We finished with a reprise of the ‘Circassian Circle’ and everyone joined in that last dance. 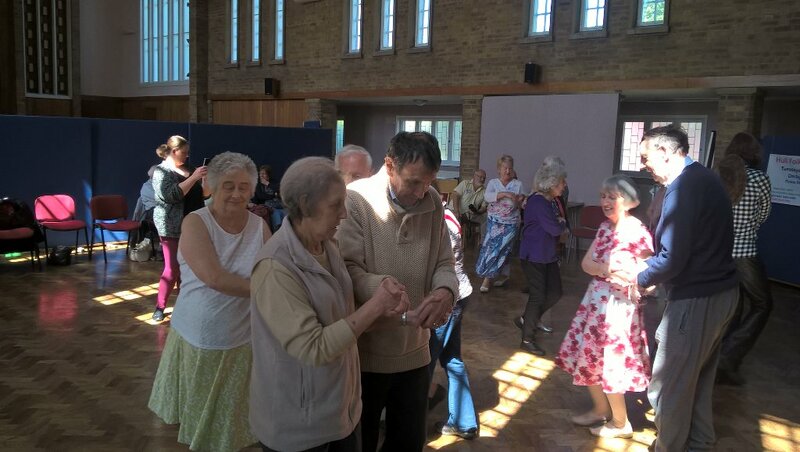 The idea behind this activity is to get the group up on their feet, joining in and having a go, having fun. If the group manages to get a bit of exercise whilst doing so, all the better. The ladies and gents from the folk dance group are really lovely, very forgiving when you do the wrong left, or mix up your dosey do with your right hand star - which I managed to do numerous times. There is a sense of satisfaction when you get it right, when you see all the moves, turns, gates and arches fall seamlessly into place, it’s a good feeling. For two hours we danced and laughed and beamed when we got it right, which wasn’t that often but it didn’t matter. Being able to relax and have a bit of fun and not worry, that has to be the best medicine of all. And here’s what a couple of the Butterflies had to say about Hull Folk Dance Club’s visit to Derringham group. So if you know your Dosi Do from your right hand star or even if you don’t, why not look up Hull Folk Dance Club and try some English Country Dancing.